Recognizable by their fine black stems and frilly fan-shaped leaflets. The Maidenhair Fern (Adiantum hispidulum) is very common in the Wet Tropics. It is found growing in moist open sites along river and track banks. It is a very popular plant for gardeners and is an ideal house plant. Courtesy of: Environmental Protection Agency, Cairns. Rhizome short-creeping, branched, very wiry; fronds numerous, erect or semi-erect up to 35cm long. Stipes black, shiny, stout, tufted, scabrid. Pinnules tough, pale green to dark green, bearing minute, white hairs, up to 12mm broad, the outer margin toothed, asymmetrically attached by a thin, short petiole. Six to fourteen sori per pinnule, in deep notches on the outer margins. 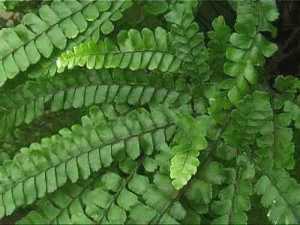 It is a widespread fern that grows from shaded rainforest to open rocky situations, where it withstands the hot dry summers by curling the fronds. The new fronds are a delicate pink colour. The rough stripe; the white hairs on the pinnules; the large number of sori on the pinnules. Qld, NSW, Vic, NT, (Central Australia); also NZ, Pacific islands, tropical Asia and Africa. A Very easy and hardy species to grow. Grows best in a semi-protected position in the ground.